It is said that the first person to illustrate the colour wheel was Sir Isaac Newton in 1660. He was believed to have been studying how white light reflected off prisms and as he directed a beam of light through a prism he noticed a rainbow effect. The light had split into a spectrum of colours from red tones at one end to purples at the other. By joining the two ends of the spectrum Newton formed the idea of the colour wheel. 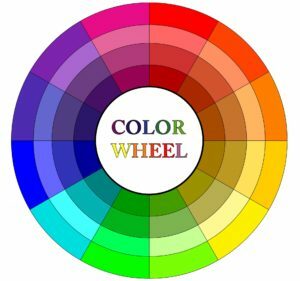 The colour wheel is a representation of twelve hues which begin with the three primary colours, then three secondary colours and six tertiary colours. The primary colours red, yellow and blue cannot be formed by mixing any other colours together however, any colour can be made by using a combination of primary colours. Secondary colours are created by mixing two of the three primary colours together resulting in orange, green and purple. 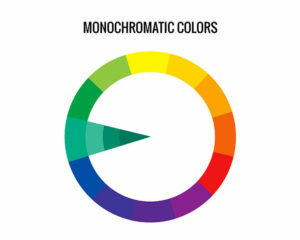 The last group of hues, tertiary colours are made by combining a secondary colour with a primary colour. These tertiary colours are named red-orange, yellow-orange, blue-purple, red-purple, yellow-green or blue-green. We all know that there are far more colours than just the twelve on the colour wheel – but how are these colours created? HUE – this is actually another word for ‘colour’ and traditionally refers to the twelve primary, secondary and tertiary colours on the colour wheel. SHADE – by adding black to a hue you will darken it and are creating a ‘shade’. For example by adding black to red you can create a maroon, which is a ‘shade’ of red. You can create different ‘shades’ of a hue by adding varying amounts of black. TINT – A ‘tint’ is the opposite to a ‘shade’. By adding white to a hue you are lightening it and are creating a ‘tint’. For example by adding white to red you can create a pink, which is a ‘tint’ of red. TONE (or SATURATION) – is a hue dulled with grey. By adding black and white to a hue desaturates it making it less intense or pure. So, by adding black, white and grey to the original hues you can create an endless amount of darker, lighter, brighter and softer colours. Now we have gone through how colours are made, lets now talk about how the colour wheel can be a practical resource when choosing colours for a design project. There are five main colour schemes which can create visually pleasing and well balanced combinations. It is generally best to use one colour predominantly (either because of how much it appears, or because of how it stands out in comparison to other colours in the design) and use the other colour/s as accents. A monochromatic colour scheme is always a winner as it’s subtle yet effective. It is derived from using only one single hue and then using its various tints, shades and tones to create the rest of the scheme. For example, a range of greens varying from light to dark create a soft elegant combination. 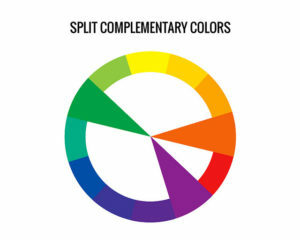 Complementary colour schemes are based on the use of two colours which are opposite on the colour wheel. For example: red/green, blue/orange and yellow/purple are all complementary colours. Using this scheme can be tricky as they create high-contrast, especially when the pure hue is used for each. 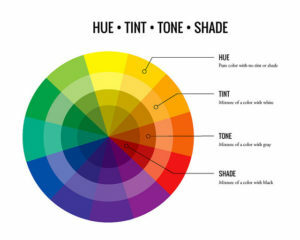 To help achieve a more balanced and harmonious design try using relevant tints of the colours. This scheme is great when you want something to be vibrant and stand out. The split-complementary colour scheme also has strong visual contrast and is a variation on the complementary colour scheme. It comprises of a base colour from the colour wheel along with the two colours from each side of it’s complementary colour. For example green, red-yellow and red-blue create a split-complementary scheme. The base colour is usually the main colour, while the two others should generally be used for highlights and accents. Three colours adjacent to each other on the colour wheel create an analogous colour scheme. This scheme is easy to apply in designs and is visually pleasing and less contrasting. Analogous colour schemes are often found in nature. A colour scheme where three colours are chosen that are equally spaced apart on the colour wheel. 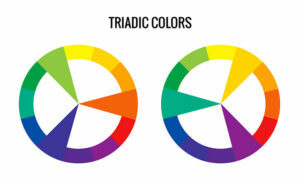 Triadic colour schemes tend to be quite vibrant but can be softened slightly by using tints and shades of your hues. Designers continue to refer to the colour wheel when necessary as it helps create harmonious schemes and is a fail safe way of working out what colour works with what. Obviously most homes consistently use neutrals (which are not on the colour wheel) and add accents of colour for interest and fun. For information on which paint finish to use where click here.